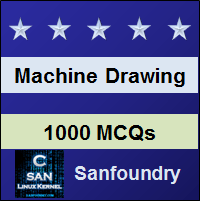 This set of Machine Drawing Multiple Choice Questions & Answers (MCQs) focuses on “Methods of Size Description & Drawings Preparation – 1”. Explanation: In production line since it is impossible to make a part of exact drawing due to the inaccuracy of machine, setting and measurement thus some deviation is allowed in given maximum and minimum limit. The system in which this variation is accepted is termed as a Limit system and the allowable deviation are termed as tolerances. 2. What is the basic size? Explanation: A design engineer calculate the size of an object using theory of failure and then give the size to the object with which an object of given material can withstand the stresses coming in the component, this size is termed as basic size. It is the size to which limits of tolerance are assigned. 3. What is the actual size? Explanation: The actual size the dimension obtained of a product when it is manufactured and come out of the shop. It may not be of the same size as given on the paper and comes in the dimension between the given tolerances. Simply the size of the manufactured component is actual size. 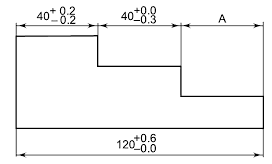 Explanation: Tolerance is the difference between the maximum and minimum deviation that can be given to a component size thus tolerance is defined as the difference between the maximum and minimum limit size. Explanation: Generally tolerance is provided in the narrow region, however, narrower the tolerance more difficult it is to manufacture a component thus the cost of manufacturing does depend on the tolerance specified and it is inversely proportional t0 the tolerance provided. Explanation: Since there is given with the deviation on two sides this means this is bilateral and as these deviations are not equal that tells us that the type of tolerance is unequal bilateral thus option c is the correct answer for the given figure. So only 40.00 lie in between 39.8 and 40.1. 8. What is the minimum dimension of the given shaft up to which it can be machined? Explanation: Since the size of a component can lie from the maximum limit to the minimum limit. =35.79 – 0.3 = 35.49. 9. What is the type of the tolerance provided here and dimension of the given object in the figure below? Explanation: Since the given dimension is with deviation on both side equal to the 0.05 and have the basic size of 50 thus the minimum size is 50 -.05 = 49.95 and maximum size is 50+0.05 = 50.05 and the type of the tolerance given here is equal bilateral. Explanation: The given dimension are the limits written one above another where upper limit is written above the lower limit, here maximum dimension is 50.05 and minimum dimension is 49.98. If we were to calculate size assuming basic size equal to 50 then tolerance are equal to 50.05 – 50 = +0.05 and 49.98 – 50 = – 0.02.